Newton, MA The New England Chapter of SIOR held its annual Robert W. Holmes Scholarship Night at Brae Burn Country Club on October 4. The event started at 6 p.m. with passed appetizers and cocktails. This evening event was held jointly with the MIT Center for Real Estate. The New England Chapter has been teaming up with MIT Real Estate to offer a tuition scholarship to a premier and worthy student in the MIT Center for Real Estate. The New England Chapter also extends a $2,000 scholarship to an up and coming Boston area commercial real estate broker. The $2,000 can be used towards an SIOR national designation course or towards an SIOR national convention as a guest. The New England Chapter president is Mike Giuttari, president of MG Commercial Real Estate in Providence and the head of industry relations for the MIT program is Steve Weikal. This year’s sponsor for the evening was Vantage Builders with president John Connor. There were 35 attendees including the presence of global president-elect of SIOR, Mark Duclos. Giuttari started the evening introductions stressing that although SIOR has a global initiative, the society has not forgotten its national components and chapters. He thanked Tim Brodigan, who was the outgoing chapter president, for all his work and hard efforts during the last two years. Giuttari has completed the development of his board of directors and was ready to attend the SIOR Fall Conference. Giuttari then discussed the joint relationship with MIT and the grant program. 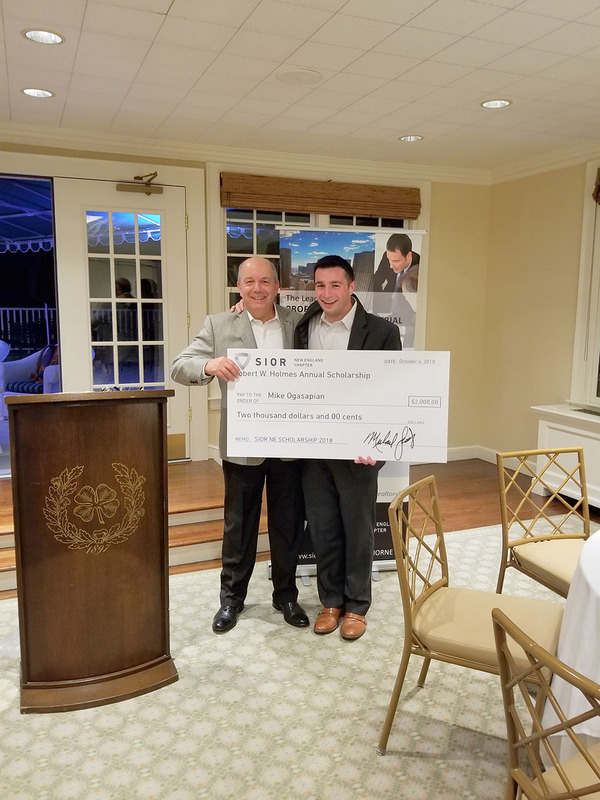 SIOR gives $5,000 to a current superior MIT gradate real estate student. The $5,000 grant is to be used for MIT tuition. In addition, the SIOR chapter gives $2,000 to an up and coming current practicing Boston commercial broker. The $2,000 grant process starts with nominations during the summer and an application process. The chapter has a committee and a board of directors who vet out applications to narrow the choices. Then a decision is made to the awarding recipient. The $2,000 is typically applied to an SIOR designation course that the grant recipient. It has been four years that the SIOR Chapter has teamed with MIT on a scholarship for one of its top students. MIT also involves Steve Weikal or another MIT official to speak at the SIOR National Convention on new trends or disruptor topics in real estate. Giuttari then announced this year’s MIT recipient, Charles Hope. Hope is currently a MIT real estate graduate student majoring in real estate development and commercial investment sales. He will be completing his M.S. in Real Estate Development in June. His background is quite extraordinary. He is from Ft. Worth, Texas. He is a graduate of Texas A&M, then he joined the U.S. Air Force where he became a fighter pilot. He specialized in F16 Fighter jets. He has also obtained top U.S security clearance. He has competed in triathlons as well. On receiving the grant, he thanked SIOR and MIT for its support. Giuttari then explained the genesis of the New England Chapter Scholarship Award. The scholarship is in its 12th year and named after Bob Holmes a former chapter president and consummate real estate veteran. His son Garry became an SIOR and has held numerous leadership roles with the Society. The award is to emulate Bob’s strong moral compass, ethics, real estate knowledge and thrust for continuing education. This year’s recipient has all of these traits. The recipient has six years in residential and commercial real estate and has participated in many SIOR chapter events, golf outings and meetings. He started his career working at Goodrich Residential in Boston for 2 years. He then moved to RW Holmes for the last four years and specializes in commercial leasing. He plans to transfer over to investment sales. He plays goalie in hockey and is a graduate of Saint Michaels College in Colchester, Vermont. The recipient is Mike Ogasapian. Ogasapian thanked the chapter for the award. He said that he wants to become an SIOR. He was registered for the November SIOR Atlanta Designation Courses and will be applying the $2,000 grant to the course. The SIOR courses will help him to fulfill the requirements to earn the SIOR designation. He thanked the chapter. The event was celebrated until 8 pm. The chapter would like to again thank Vantage Builders, Inc., commercial construction, for being the sponsor for the evening.